Two evening of solos involving other people and longer form work. It has been awhile since I have curated and produced a show of my own and will be the first time in St. Louis. I am bringing in a couple surprise special guests. An evening told in two parts that also stand alone. Lisa Natoli, in collaboration with S.L.A.C and The Monocle, presents and curates an evening of longer-form aerial performance, exploring themes of the body as politic and ideas that cannot be categorized or necessarily explained. The work seeks to push the limits of the art form in performance while asking the audience to be a present observer. all ages allowed (adult subjects, cussing, and states of undress in show.) no content based refunds. About: Bright Ideas is an aerial performance company founded in Brooklyn in 2008 and influenced, in part, by my background in dance and my childhood in 1970’s New Orleans. There, art and everyday life seemed to be rubbing up against each other at all times, wherever you looked, until it was hard to tell where one stopped and the other began. It has had an enormous effect on how I conceive of and create work: no separations or compartmentalizations, everything factors into everything else. A meal, a line of text, music, a performance I saw, the way someone walks across the street, all have an equal chance of inspiring my next piece. Lisa Natoli also known as Iron Fanny is an aerial performance artist living in transit. 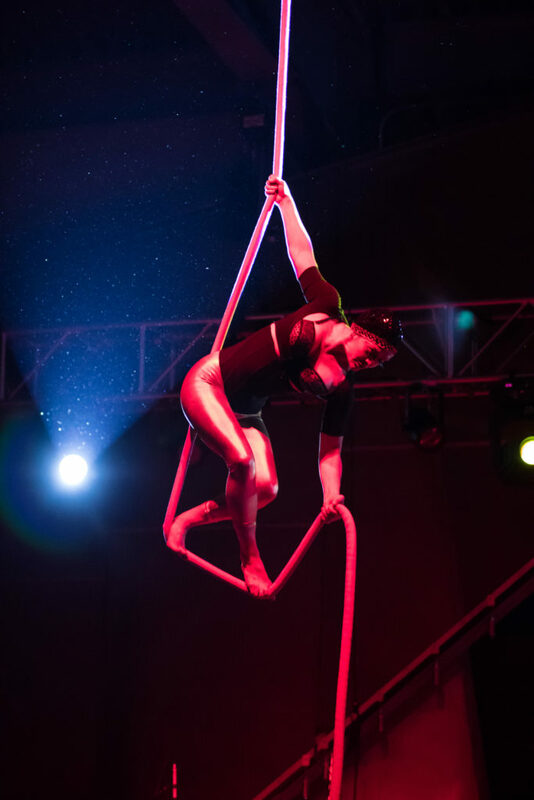 She is a sought after aerialist known for her unconventional approach and intensity of artistic curiosity. She’s that character in films and books we root for, except this one’s flesh and blood. Her art isn’t printed, published, or filmed. It can’t be sold off a merch table. It exist for a moment of beauty, right in front of you, and then it’s gone Lisa worked on a creation project with Spiegelworld directed by Steven Hoggett at St. Ann’s Warehouse(NYC) in 2017. 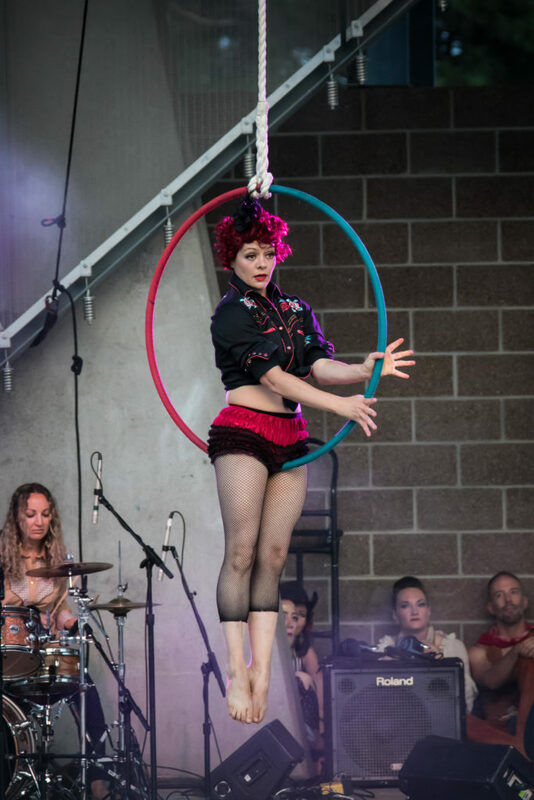 She has presented solo and ensemble work at The Toronto Contemporary Circus Festival, The House of Yes, Galapagos Art Space, CBGB’s Gallery, The Brooklyn Lyceum, Gowanus Ballroom, MonkeyTown, Invisible City, The Clocktower Cabaret, and with Black Hearts Burlesque. Aerial Show and Tell is an informal bi-monthly show giving our students, staff, and special guests a platform to generate aerial performance art. The audience becomes a part of the creative process, as our aerialists discuss their pieces and get feedback on their work. Come and be a part of the conversation as extraordinary feats of aerial artistry and storytelling are shown. Free for students enrolled in previous or upcoming session, free for members, free for children 8 and under, $5 for everyone else. Bring cash for refreshments. This show is family friendly. April’s Line up is a Windy City Invasion featuring Chicago Burlesque Beauties Naughty Natanya, Dusty Bahls, Dahlia Fatale, & Shimmy La Roux with special traveling aerialist Lisa Natoli, and local showgirl sensation Bibi Dazzle! Photo by Linus Gelber at Irondale Theater. I am judging this really cool virtual contest with some really talented people. Check it out and bring something to the table. Inanimate 48 is a 48 hour contest for dancers who use weight bearing apparatuses. This can be aerialists, circus artists, pole dancers, or people who just like to wiggle around on big, inanimate objects, whether or not you know any technique or tricks 🙂 Starting Friday evening on January 25th, you have 48 hours to create a brand new choreography, film it, and submit it online. Feel free to spend all weekend working on it, or maybe just whip something up in a few hours. Submissions will be reviewed by a hand selected panel of dance and artistic professionals. One winner will receive a cash grand prize, but there can be any number of honorable mentions. You can do any style of dance, use any apparatus, have any number of people in your choreography, have any length of time, film in any way you want, do it at home, in a studio, outdoors, where ever! We want to see your creative chops. This is your chance to do the kind of art you may never get to do in a typical competition or showcase setting. I am guest teaching for a couple weeks at Awakenings Pole & Aerial Fitness Studio. September 28 featuring the hula hooping cutie Hoopsie Dee, the magical Amanda Lindsey, Colorado’s lovely lyra lady Lisa Natoli, and as seen on The Gong Show remake, Comedy juggler extraordinaire Jim Mackenzie! Mimi Le Uke hosts this special show! 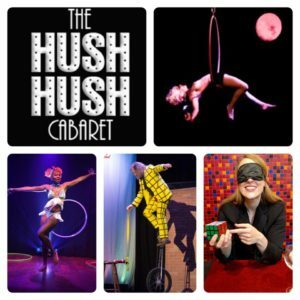 Join us for a terrorfying, electrofying, thrillin-inspiring night at the Hush Hush Cabaret, the Monocle’s exclusive po-up late night show, as we howl at the moon at some hair raising acts! Its Halloween and what could make this season better than a little boo-lesque! This edition’s cast features locals Vera Valentinaa of the Glimmer Cabaret, and Chi Chi Buxom of the Bon-Bons Burlesque Boudoir with special guest appearances by Colorado’s lovely lady of lyra Lisa Natoli and the Limpest Wrist in Burlesque Willy LaQue of Chicago! More cast announcements coming soon as we want a jam packed night of scream-worth sirens! Tickets are $10 in advance. $15 at the door. Grab your tickets today for this one-night only howlabration! Some rules were made to be broken, and Rebel, Rebel does just that! This showcase challenges the status quo by reimagining the world of cabaret through the minds of the neo-burlesque movement’s most inventive arbiters. Hosted by Marcel Michelle-Mobama. Featuring Ray Gunn (Chicago), Nox Falls (Amarillo), Jacqueline Boxx (Baltimore), Elektra Cute (Minneapolis), Spikey Van Dykey (Sarasota), and more! St. Louis 4 Week Workshops Sept 26th-Oct 18th. 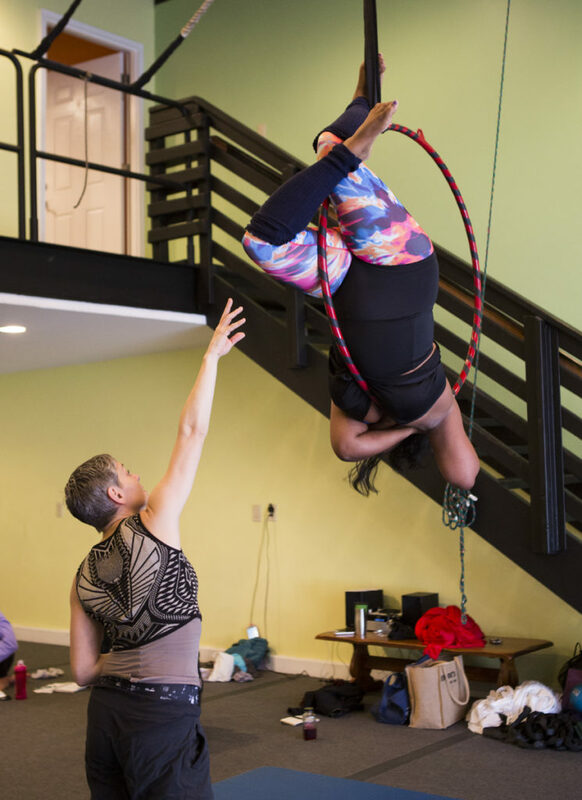 This workshop is for aerialists who want to broaden their boundaries and identify habits, assumptions and expectations in their artistic practice. We will work towards creating a coherent, thinking body by building awareness using techniques and skills collected through research and experience. 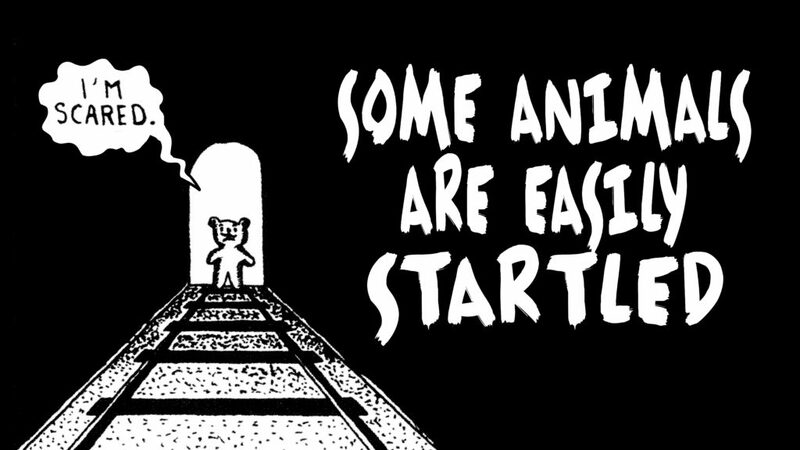 We will integrate transitions and “tricks” into sequences. Prerequisites: be able to invert in air repeatedly and understand a hip key and s-wrap. 4 classes, 1.5 hours each. Not eligible for member discount. This workshop is for students who want to explore classic hoop vocabulary by way of contemporary thought. We will explore points of static and rolling contact and examine weight shifts that can help us find unexpected places of balance and release. You’ll gain movement awareness that supports intuition, technique, and your development as mover and creator. 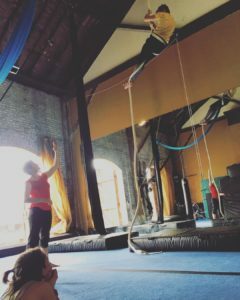 Posted in Teaching	| Tagged #ironfanny, #lisanatoliworkshops, #SLAC, #stlaerialcollective, #stlouisaerialist	| Comments Off on St. Louis 4 Week Workshops Sept 26th-Oct 18th. 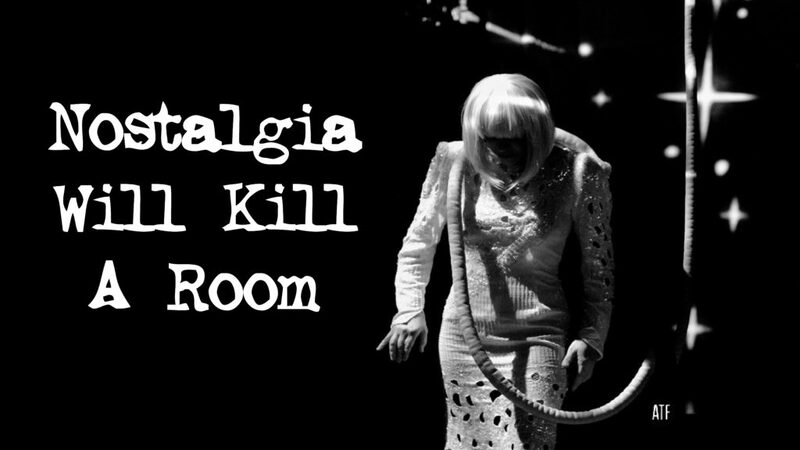 I will be performing a revised lyra act this coming Friday August 24th at The Clocktower Cabaret in L’estrange Menagerie produced and curated by Tatianna Tata.